Creosote is a byproduct of wood combustion that consists mainly of tar. Traces of creosote are found in the smoke that rises from open flames; when the smoke travels upward and mixes with cold air and water near the top of a chimney, it solidifies and sticks to the chimney liner (or, if the chimney is unlined, the brickwork itself). Interestingly enough, creosote is actually what gives “smoked” meat its distinctive flavor, scent, and stability. The main issue with creosote is that it’s extremely flammable. 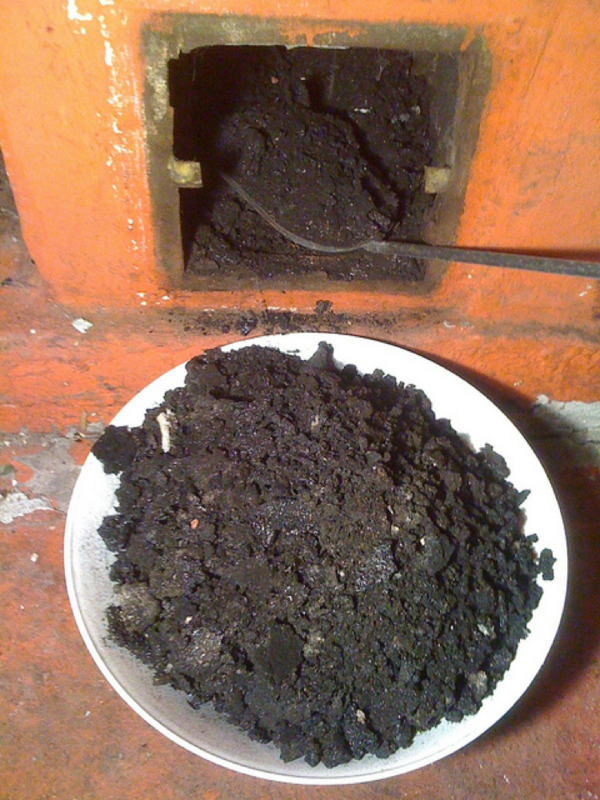 As the amount of creosote inside the chimney flue increases so does your risk of a chimney fire. And not only can a chimney fire completely wreck your chimney and mantel, but it can also turn into a destructive and deadly house fire. The other problem with creosote is that it doesn’t go away on its own; it “grows” in a kind of self-perpetuating cycle. Creosote accumulates due to a lack of open ventilation, which causes the creosote to coat the walls of the chimney flue, which narrows the passageway, which restricts ventilation even more, which in turn causes more creosote to accumulate inside the chimney flue…repeat ad infinitum, or at least until something (e.g., total blockage or a fire) renders the structure completely unusable. Well, there’s really no way to stop creosote completely. Because it forms naturally when fuel sources are burned, trying to prevent a fire from creating creosote is a bit like trying to prevent a fire from creating smoke. If you’re terrified of having any trace of the stuff in your home, your only surefire options for avoiding it completely are to (A) deep-clean the chimney every single time you burn something, or (B) never, ever use your fireplace again. That said, the presence of small amounts of creosote in your chimney isn’t that big of a deal—it’s a buildup of creosote that’s problematic. You can reduce the rate at which creosote compounds by making sure that your chimney is adequately ventilated; if you have any reason to suspect that the chimney’s inner mechanisms aren’t working properly, then have it inspected as soon as possible. You should also have the chimney professionally cleaned at least once a year, as this will interrupt the growth cycle of the creosote and prevent it from spreading out of control. Small amounts of creosote are present; the mess actually consists primarily of soot. The creosote has a thin, flaky texture. This “initial” coating can very easily be brushed away by a technician using a specialized brush. A medium amount of creosote is present; it’s now more tar than soot. The creosote has a thicker, harder texture but is still crumply. Brushing alone may be ineffective for removing creosote at this stage, so chemical solvents and rotary loops are often used to loosen things up. A large amount of creosote is present; it’s highly concentrated and very At this stage, the creosote will either feel sticky and oily (if the coating is fresh) or feel hard and have a shiny appearance (if it’s been “baked” repeatedly). Brushing will now be completely ineffective, and chemical solvents and rotary loops will have trouble getting through the gunk. In some Stage 3 cases, it may actually be more cost-effective to simply replace the chimney liner than try to clean it! If you stay on top of things, you should be able to “catch” the buildup in Stage 1. Don’t wait until you’ve reached Stage 3 to deal with the problem, or your health, property, and wallet may wind up taking a serious hit! Another thing we often say on this blog is that chimneys must be properly maintained in order to function safely. Well, staying one step ahead of creosote buildup is an important aspect of chimney maintenance. So don’t put off having a licensed chimney sweep evaluate the and fix your creosote situation. Think of it this way: it’s much faster, easier, and less expensive to have a technician brush away the nasty stuff tomorrow than rip out your chimney liner a few years down the road. By Tony|2018-05-31T18:17:11+00:00January 31st, 2018|Chimney|Comments Off on What is Creosote and Why is it So Dangerous?